You are in for a real treat as Erin and Madame Samm have set up this hop for us - Thank you both so much for the time and energy you put into making this great! Although the theme of this hop is April Showers, I extended it out to brings May flowers! 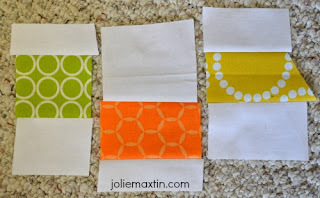 One other change, this is a mug rug blog hop, but I feel like mine should be a plate hop, as it turned out much larger than I was anticipating, which means this project can be utilized for many different purposes. I can surely use it for a cookie and a cup of tea, a placemat, and under the centerpiece of tulips! This project was inspired by a block that Christine requested in one of my bees. She wasn't even in my hive but I loved it so much that I made her one just because it was so fresh and fun! Line up the top edge to whatever mark you think is best, and trim. I used 6" for this project. Cut out 20 blades. 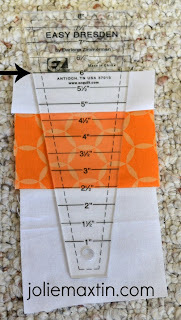 Once your blades are cut arrange them to your liking and then snap a quick photo with your phone (that way no matter what order you sew or press them in, you can put them back in the arrangement you like best). Sew all blades together and press well. 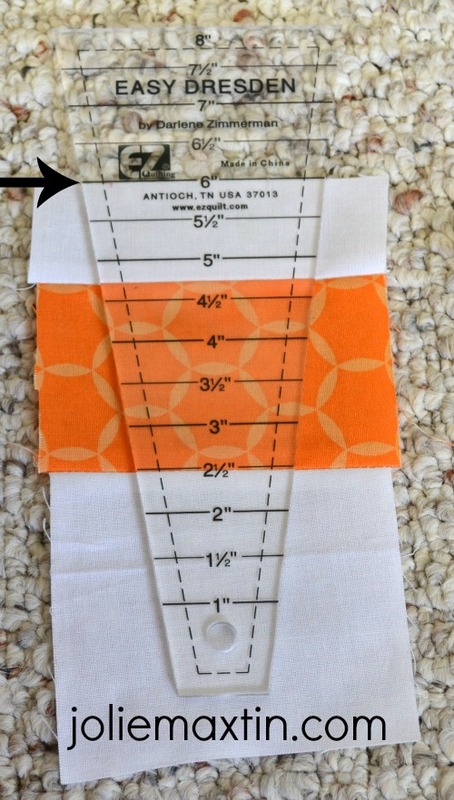 For the center, match a fabric in one of your blades and cut a circle big enough to cover the hole. 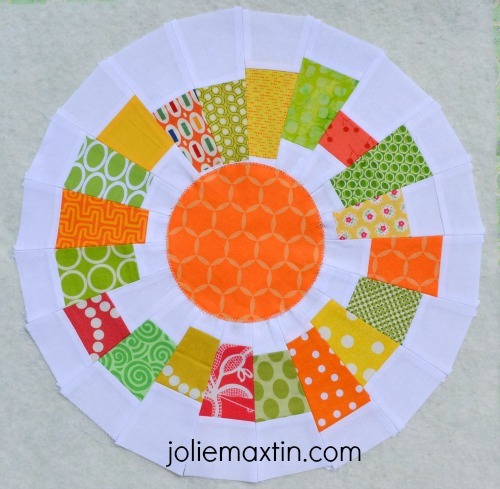 My circle is the largest size on the Accu-quilt cutter, which measures 5" in diameter. Attach to your outer circle in any manner you prefer. I used a few small drops of Elmer's washable glue. (This is the first time I have tried this method, the iron set it well and I would try it again on future projects . Attach this to batting and backing and quilt as desired. I chose to quilt 1/4" on the inside of each blade and did not quilt the middle (as my original intent is to use this underneath my spring flower vases). 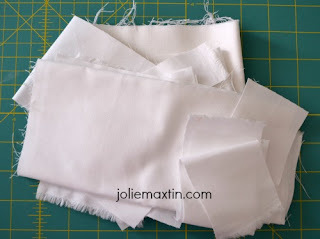 Once I was done quilting, I did go around the outside with a scissors and trim away some of the outside edge. Next up is to attach the bias binding. Never have I attached/sewed or even cut bias binding, but I know bias is better when you have a circular shaped project and the $2 or so it cost to buy it already cut was well worth it to me. Pin the binding, sew 1/4" in with matching thread and you're done! This was a picture heavy post so thanks for sticking with me and if you have any questions or suggestions please comment below. Also, please show your support for so many of the other fabulous bloggers who have more projects for you to look at today too! This is so cute - spring color and love the cute whimsy of the blades. And trying new techniques - kuddos to you! It is adorable! Mug rug or Vase rug- too cute! I love your circular mug rug! Thank you for the great tutorial and for sharing. Great idea for a mug rug... Thanks for sharing! Thank you so much for the tuto! I love your sunny mug rug! It is a pretty mug rug, it brings a smile on my face. Love the design and colors. Thnx for the tute! You have made a lovely design. Thanks for the tute! I LOVE your mug rug! the colours are so bright and cheerful and I love the design! It's bright and beautiful! Love it. You did a great job! Jolie. Those colors are happy and bright for Spring and you did a fabulous job with them. I would have a hard time keeping that small, too. I like the size - perfect for keeping a snack on there, too! Love it! and I love it when a post has several photos. text only gets too boring. Love it! Fabulous colors...and I like the shape and the fact you can use it for several purposes. Thak you for sharing it and the tutorial with us. You can never have enough pictures! Your mug rug is very unique - love the colors! Thanks for sharing your pretty mug rug & tutorial. Thank you so much for sharing this. I love it so much I might just make one for myself! Very fun project! I just love it. Your choice of crisp, clean colors make your rug really pop. White always sets things up nicely. Nice job! Love the bright and cheerful colors and that it is round too. That is a great way to use up scraps too. Thanks for sharing your beautiful project and the tutorial too. Really cute mug rug! I love that it can be used as a candle mat or centerpiece too. Also love the bright, spring fabrics! Added to your description, if I may, is the wonderful spring colors that your mug plate has. Great job..larger or not I wouldn't mind having it on my table...enjoy your day. What a bright and cheery plate rug you've made! It looks just beautiful as part of a table centerpiece! Love it! 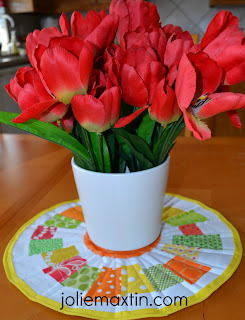 I love the way you used your Dresden ruler to create this beautiful mug/plate rug..really love the colors, too! Wow Jolie this turned out beautiful. Too cute! Love it and thanks for sharing. Love your mat! So springy! I love your bright colored rug, it brings springtime to mind! Thanks for your tutorial! Thanks for showing, enjoy your day! What a vibrant and springy mug rug, and a great tut ! So cute! Love your color choices and thanks for showing us how! What a cheerful mug rug! Thank you for showing us how you made it! I love the bright colors and the circular shape! I'd love to try this. Thanks for sharing! Thanks for the inspiration! Love what you did with the wedges! A VERY modern Dresden Plate!! Love it!! Very pretty. The colors are wonderful. 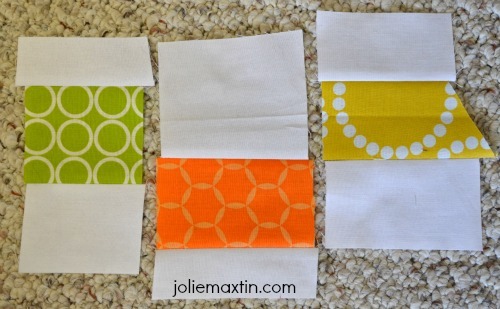 Thanks for showing us how you made your cute mug rug/plate rug. Very pretty. I love Dresdan plates. Very nice! The colors remind of a citrus slice---and maybe that was what you were aiming for! Well, you did it in that case. THX for the tutorial. This is so pretty. I really love it. I think I want to try to make this. Amazing what those spring showers can do! Very cute mug rug. I love those colors. 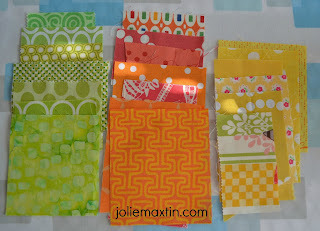 I like to use the precut bias also and am happy when I can find the color I need and don't have to make my own. A perfect place to put your flowers, what a beautiful picture. I love your mug/plate rug, it is so cheery. It certainly brightens my day. Very, very neat; I love the bright colors. It surely looks like spring. Thanks for the tut - another use for my dresden ruler - hurrah! Love your mug rug. It is so cheerful with it's pretty colors. Great job. Thank you for sharing. Great post. I love your mug rug. Great choice of colors! Thanks for sharing. Your mug rug is fantastic! Love the colors! Thanks for putting together the tut, I know it takes extra effort! My mug rugs end up being on the biggish side too! I love your final photo & how it looks w/the vase of tulips! Thanks for participating & inspiring us today! I am a new follower too! Your mug rug is original. I love it! Thanks for the tutorial! I just discovered your blog through this blog hop and now I'm following you via GFC, my day to participate in this blog hop is on April 15, now I will continue to visit the other participants. You did a nice job!!! Love the bright citrus colors you used. Thank you for sharing your lovely mug rug and tutorial. 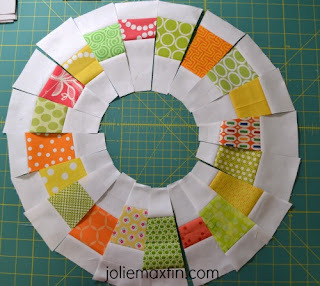 Fabulous tutorial, and I love the circular mug rug - so different from most that you see. Thanks for showing us how it is done! I love your umbrella mug rug in citrus colors. It shouts spring! Thanks for sharing how you did it as well. Love your stunning mug rug.Thanks for the tutorial!! Such a fun mug rug....got any tips on the cardboard template? I am on a budget but would love to try this project! Very unique and the colors will chase the rain away. Lovely vase rug. Very cute and useful! What a fun mug rug and thanks for the tutorial!! Love it! Great tute too! Love your citrisy mug rug - thanks for sharing. OH MY GOSH!! How exciting to see the block from my Bee being showcased in a Mug Rug! I love it! And the block you sent me looks fabulous with all the other blocks that I received! Thank you again..and I love that you did a tutorial! I love your mug rug! And I love that it is different too! Wonderful! So fresh and bright! Thanks for the tut. Great colors so bright and April here in Michigan is when you finally start to see them pushing through the ground. What a great tutorial and those colors are, as my granddaughter would say, "Fab-U-licious!" Love your style! Will definitely be coming back to see more! 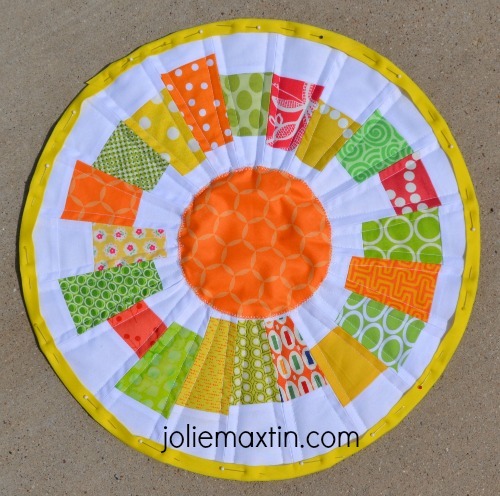 I love how bright and cheerful your "plate" rug is! IT's wonderful! and I love the tutorial too. Thank you for sharing! OMG! I love, love, love your mug rug! I mean seriously it is amazing and I love your style. So much so, that I have signed up to follow your blog - thanks for brightening my day! If you don't mind, I have pinned your mug rug to my Quilt and Sew board. Great mug rug. Love the cheery colors. That is one of the most cheerful and happy mug rugs ever! Love that it can be used for so many different purposes! 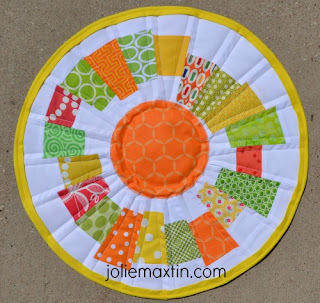 Great mug rug, love the bright, cheery colors! Works super under your plant. Thanks for sharing. Love your round rug and all the cheery colours. Thanks for the tut. What a wonderful take on the theme! Thank you for sharing. Nice colours, great job. Thanks for sharing. So bright, so cheerful and round. Who da thought. Great job! I am going to make one of these. Thanks for sharing. Love your round mug/plate rug! The colors are so citrus'y. Thanks for the tutorial too! Great job! I really appreciated your tutorial with photos, as this looked really complicated, but thanks to your instructions, I am going to tackle it. It is stunning - love it! Your mug rug is gorgeous. Thanks so much for doing a tutorial. I'm just looking through all the post and having a great time seeing everyone's creations and finding new blogs. I'm you're newest follower. Julie that mug rug is Spring-tastic! Very nice of you to include a tute as well. Thanks for sharing. Super craftiness! Thank you so much for participating with us in this hop! This is darling. Thanks for the tutorial. What a cheerful mug rug that has many other uses! I love it! Thank you for sharing. Your mug rug is gorgeous and thanks for the awesome tutorial. Love the bright colors and circular design. Very nice. Thanks for the great tute. Gorgeous mug/ plate rug. I really love your fabrics. It would make a great table topper as well. Thanks for shareing it with us. Very pretty! It looks so nice under the tulips. So pretty. Thanks for the tutorial for this lovely. Love the colors- thank you for the tutorial! I love it! The colors are so pretty ;) It's definitely one of my faves so far! What a pretty little rug. the colors are so fresh and pretty. That is so cute and different! Clever idea too! A colorful creations. Thanks for sharing. Thanks for your mug rug tutorial! I'm going to try this. I love your results - so arty! Oooh I love this - very unusual, thanks for the great tutorial too.